Let’s talk cute, modern, and stylish details! Think Garnish offers a wide variety of favors for all of your wedding occasion needs! 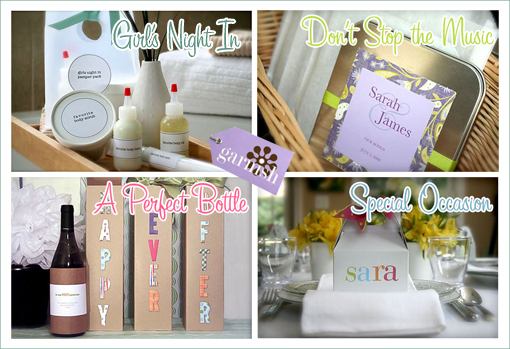 We’re taking, bridal showers, girl’s nights, wedding favors and much much more! We personally LOVE the white cups with lids along with the natural labels. As coffee fanatics, we would be thrilled to leave with a yummy cup of joe-to-go with the bride and groom’s name! You’ll have to visit Think Garnish to see what we are talking about! There is also a very special coupon for our readers! Just type in GWC08 and get 10% of your order! Thanks Think Garnish! Read on for tons of ideas! Girl’s Night In! Calling girls of all ages… now is the time to celebrate your girlfriends. Get the gang together and do a little primping, plenty of chatting and tons of giggling. Put on a great chick-flik or some tunes on the stereo and settle into an evening of face masks and nail painting. At the end of the evening treat your friends to their very own spa kit. Fill our time in a bottle containers with your favorite bubble baths and lotions labeled with our stick em up labels. Garnish's that can make the sun shine, plastic tubes look beautiful when filled with some bath salts. Add some facial scrub, homemade or not, to our no soup for you container and place it all inside an oh goodie frosted bag embellished with our stick ‘em up labels. girl’s get together, with Garnish you'll be celebrating in style! Don’t Stop the Music! Doesn’t music always have a way of making us smile and bringing back fond memories of a special time or place? Put together your favorite tracks for a wedding favor or party favor that your friends will actually use. Enclosed in our tin CD case your gift will not only be enjoyed by their ears, but also their eyes. If you’re the photographer of the group, create a thank you gift by placing a selection of photos from the day on a CD. Sometimes the host so busy with the day itself they don’t have a chance to actually see what went on! With Garnish, it’s all so easy. Now that’s music to our ears! A Perfect Bottle! This is an idea you will find yourself using over and over. Dress up Garnish's wine box to fit the occasion or your mood. Create a wedding gift that will be enjoyed for years to come. Choose several bottles of wine to be opened on the couple’s first, fifth, and 10th anniversary (or as many as you choose!) Use our kraft paper sheets to create a paper sleeve for the bottle with a personal message. We used letter stickers found in the scrapbook section of the craft store to garnish our boxes. Chaeteauneuf du Pape for the 10th anniversary. For the first anniversary, why not a bottle of Moet and Chandon Brut Rose. A flavorful European fruit soda placed inside the wine box makes a lovely hostess gift. Wine tastings are a hot trend. Disguise the bottles with some kraft paper and send your guests home with a bottle from the evening packaged in a box. Make a label using our stick ‘em up labels. If the bottle is from a group of people, consider having everyone sign the box itself. You will never look at a “box of wine” the same way again! Special Occasion! Place a party favor inside one of our many boxes or bags. We love the frankly my dear small white gable box. Flowers are beautifully displayed in our no soup for you containers. Tie some pretty ribbon on top and spell out each guests name using scrapbook stickers or rub-on letters. Please keep in mind, stickers work better than markers on the white semi-gloss boxes. Voila , a party favor and place card all in one!